If you’re ever in the 1000 Islands, visit the Thousand Islands Art Center in Clayton, NY. They have exhibits and offer a variety of classes. Photo by Grey Catsidhe, 2014. 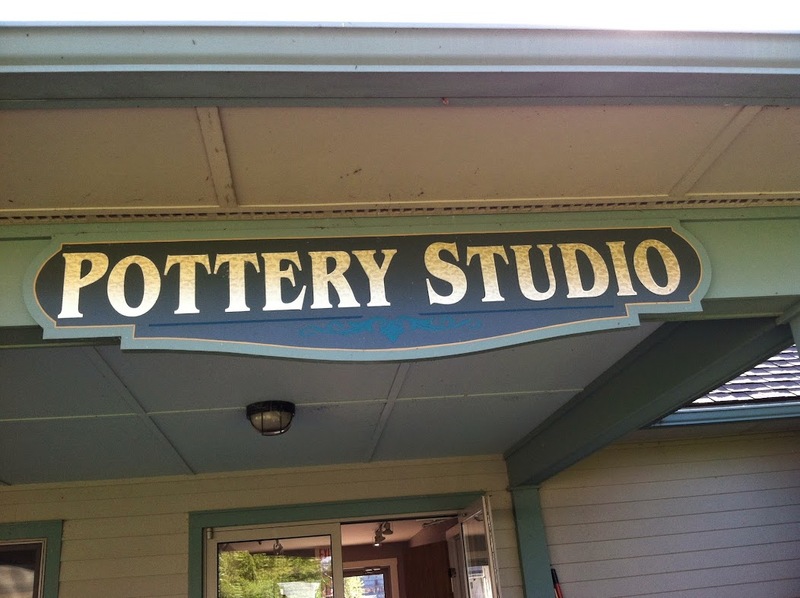 Last Sunday, I was called on by a friend in my community and protogrove to sain her workspace – the pottery studio at the Thousand Islands Art Center. It was a wonderful experience for both of us, and I learned a lot! I was extremely humbled when she asked me to perform this ritual. She told me she felt I had the experience and that she trusted me. Not only did this make me feel good about myself and the rituals I’ve been leading in the area, but it reminded me of why I started Northern Rivers Protogrove. It’s always been for community. Not only is gathering with like-minded people to celebrate the seasonal changes and honor the Kindreds deeply fulfilling to me, but it is to others as well. When I started the study group that would evolve into Northern Rivers, the growing interest and feedback I received clearly showed that there was something lacking in the area. I returned to my Initiate Letter of Intent in thinking about this because I remember writing a lot about community. I wanted to continue within my tradition’s study programs to grow in my spirituality and to give back to others. Agreeing to help my friend really reawakened that awareness of “calling” in me. It takes a lot of work and preparation to serve the community, and there are challenges as I need to balance it with the needs of my other career and my family, but it’s still very important and deeply gratifying. Before I agreed to help, I first asked why she wanted the saining. I wanted to know if she desired a general blessing because of new beginnings and old, negative energy, or if she felt there was something darker there – an angry ghost, perhaps. I very honestly told her that I have very little experience with such things and do not currently feel comfortably taking that on. We have mutual trust and she also honestly told me that it wasn’t anything of the sort. Because I never want to put my own sanity or my family’s safety in harm’s way, I don’t see myself performing sainings for anyone I haven’t known for a little while. That trust is important. Maybe, down the road, I’ll feel more comfortable helping strangers, but I just lack the experience right now. It’s important to know your limits and establish your own boundaries based on what you honestly feel are your current skills. Having done a yearly saining of my own home around the New Years (both secular and religious), I felt confident in my abilities, and my relationship with the Kindreds, for her needs. Like I said, this was a positive experience for both of us. She felt that the space was on the mend, and I felt myself putting my magical training to good use for a wonderful person. It can be intimidating to do magic and ritual for others, but leading seasonal rites for Northern Rivers has taught me that the best rituals are when I do what feels best in my heart and listen to my intuition. That’s exactly what I did. As soon as I allowed for that to happen, symbols started to jump out at me from the environment. In our discussion after the ritual, it was revealed that many of my feelings had a real basis in what my friend was experiencing. The omen, as well, was also very telling to both of us. When that happens, it feels damn good! Now I did learn some things to help me improve for the future. Next time, I should tour the entire space beforehand. I thought we would sain the studio only, but in reality she also wanted to attend to another storage area that belongs to the studio but was across the hallway. I felt a bit clumsy and annoyed with myself when she revealed this mid-ritual, but it was easy to fix and incorporate into the rite. As I always tell my grovies, we have to be able to think on-the-fly in ritual when necessary. I also forgot to bring a separate bowl for offerings. Thankfully, I set up a working altar right by a door so we were able to pour offerings in the garden nearby. Gifts from a friend. Photo by Grey Catsidhe, 2014. Let me point out that, regardless of my belief that our clergy and elders should be compensated for their work, I didn’t go about this for any other reasons than to help a friend and hone my skills. 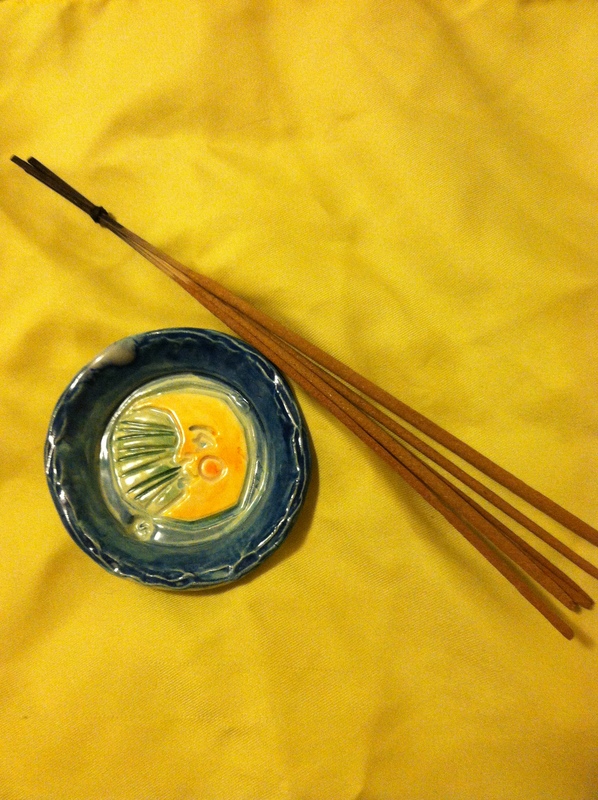 She surprised me after it all by gifting me with some of her favorite (locally made) incense and a dish that she made in the studio. I was absolutely giddy with her gifts since they are things I can use in future magical workings! These gifts are precious to me and will remind me of how good and fulfilling it is to give mack to my community. Furthermore, this whole experience will help me complete some of my advanced Druidic studies within ADF! Like Magic 2! Go me! As part of Northern River’s Autumn Equinox ritual, we had a baby saining ceremony for Bee. The rite was inspired by material gathered by Alexander Carmichael in Carmina Gadelica. In the highlands, Pagan ceremony blended with the Christian idea of baptism. Baptism was seen as a powerful force of order among those people. It was the first initiation into the community and the Christian faith (191). Baptism was valued so highly, and failure to receive one was such a frightening prospect that special cemeteries were set apart for the babies who died before receiving such a blessing. Sad little places, they were often rocky and hard to get to. “It was thought,” Carmichael explains, “that such a child had no soul; but it had a spirit, and this spirit, taran, entered into a rock and abode there, and became mac talla (son of rock), which is the Gaelic term for “echo” (190). To me, that language suggest a fear of ghosts and/or angry spirits. Although sainings have some of the familiar acts of a Christian baptism, it is to be viewed as more a blessing and protective charm rather than any sort of dedication to a specific religion. The tradition seems to come from the midwives, or knee-women, who performed their own baptism prior to that given by the priests (189). This was likely done for fear of infant mortality and how seriously the community viewed baptism as demonstrated above. However, these midwife baptisms have language that suggests they’re carried over from earlier traditions. There’s protective language against fairies and gnomes, for example (192). Indeed, if you read my earlier post about childbirth traditions in Ireland and Scotland, you’ll know that a fear of changelings was also very real to our ancestors. To protect against otherworldly abduction, newborns were “handed to and fro across the fire three times, some words being addressed in an almost inaudible murmer to the fire-god. It was then carried three times sunwise around the fire, some words being murmered to the sun-god” (189). For our purposes, Rev. Skip Ellison of Muin Mound Grove performed the saining. It was important to us that he do it because he married us a few years ago. He asked that the Three Kindreds protect Bee. He gave us an iron ring to keep near her to ward off malignant spirits. I carried a candle around her as she was held by my husband. She was then given splashes of water, “wavelets,” to symbolically bestow various qualities. Nine waves for thy graciousness” (Ellison, 147). Baby Bee after her saining. Photo by Grey Catsidhe, 2013. It was decided that I would carry my daughter from person to person in the circle to receive their blessing. Indeed, this is traditional. Carmichael wrote, “At this function and feast the child is handed from person to person around the company, going deiseil, in a sunwise direction. Every person who takes the child is required to express a wish for its welfare. The wish may be in prose or in verse, but preferbably in verse and original if possible” (191) because poetry has the tendancy to endure. Amazingly enough, Skip’s granddaughter, Dragyonfly, wrote an amazing song for Bee which she sang during this portion! We were given a copy of the lyrics as a gift. What a treasure! Acorn favors I made for guests. Photo by Grey Catsidhe, 2013. It was important to me that I show my saining guests hospitality in the form of a favor. I made several felted acorn ornaments for people to bring home. They’re reminders of their witnessing her blessing and what it meant. The basket was with us during the whole Autumn Equinox and saining ceremony so they could soak up all that goodness. I gave them out after feasting. 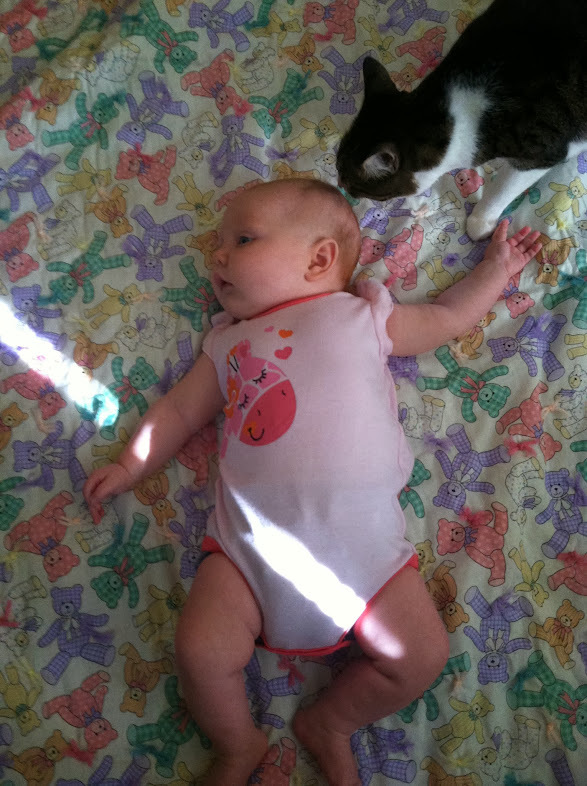 Baby Bee enjoying a fun bear blanket from Tara with a friend. So far, it’s the biggest blanket my daughter owns! Definitely good fort material! Photo by Grey Catsidhe, 2013. Bee received several lovely gifts from people in addition to the song. Grovies gave her blankets and clothing. My mother gave her a cute fox coat and some money that we plan to use for a highchair. My sister and niece gave Bee a wonderful book about nature spirits and an original painting. My little family is truly blessed! A beautiful quilt made by my grovies in Muin Mound. Everyone chose fabric and/or made their own squares. I have some truly talented friends! Photo by Grey Catsidhe, 2013. An amazing painting by my sister for our little Bee! Photo by Grey Catsidhe, 2013.